Ohio is the latest state to successfully raise its fuel tax, though the amount of the increase is lower than the 18-cent boost initially requested by Gov. Mike DeWine (R) in February. 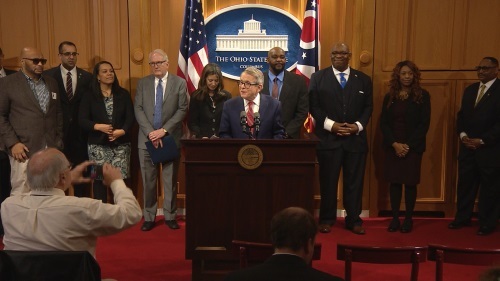 Following committee hearings and negotiations, Ohio legislators agreed to increase the state tax on gasoline by 10.5 cents per gallon and by 19 cents per gallon for diesel that Gov. DeWine signed into law. As a result, Ohio’s gasoline and diesel tax will rise to 38.5 cents and 47 cents per gallon, respectively, according to news reports. Those increases should add an extra $865 million in additional yearly funding for roads and bridges. Ohio is one of four states that successfully boosted transportation funding in the first quarter this year. Alabama and Arkansas, for example, raised their respective fuel taxes and added other transportation-related fees in March. In Alabama’s case, the legislature passed a 10 cents-per-gallon fuel tax increase, indexed to the National Highway Construction Cost, and tacked on new annual registration fees of $200 for electric motor vehicles and $100 for hybrid motor vehicles. In Arkansas, the legislature signed off on a 3-cent-per-gallon hike in the state’s gasoline tax, a 6-cents-per-gallon boost to the state’s tax on diesel tax fuel, and tacked on an additional levy based on the average wholesale price of fuel. The Arkansas transportation plan also included a new annual registration fee of $200 for electric motor vehicles, $100 for hybrid motor vehicles, and transfers $35 million annually from casino revenues to the state’s transportation fund. Meanwhile, proposed fuel tax increases are still being debated in Minnesota, Wisconsin, and Michigan. Altogether, according to the Transportation Investment Advocacy Center, 43 states introduced 231 transportation funding bills in just the first quarter of this year alone, including the now-successful efforts by Ohio, Alabama, and Arkansas. Utah also began charging owners of all-electrics and hybrid electric vehicles a higher registration fee this year as part of transportation legislation passed in 2018. That’s fueling the desire by many groups to see a similar effort develop at the federal level. The American Trucking Associations is one trade group that recently renewed its call to increase federal fuel taxes as part of national infrastructure public relations campaign it launched on April 3, with ATA President and CEO Chris Spear advocating for proposed 5 cent-per-gallon user fee added on to all transportation fuels – including gasoline, diesel, and natural gas – each year over the next four years, resulting in a 20-cent-per-gallon tax boost. Similar ideas were touted by Congressional representatives and industry stakeholders during a House of Representatives Ways and Means Committee hearing on March 8. Donohue noted that additional 25-cents-per-gallon would raise $394 billion over the next 10 years, which would then be invested in highways, bridges, and transit systems. Carlos Braceras. Photo by Georgia DOT. He said that ultimately means federal highway programs are expected to experience a 51 percent drop after the FAST Act expires in 2020, while federal transit programs would have to be “zeroed out” in 2021 and 2022.